Motion Filtering - Enhanced dual "harmonizer" filtering settles down weight display for increased accuracy and viewing ease. 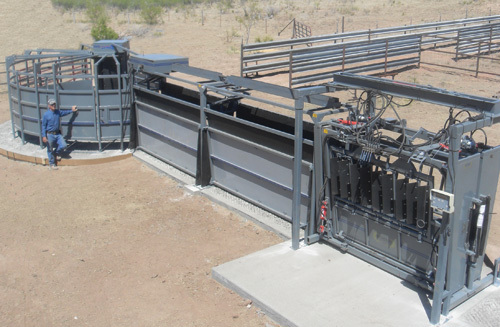 The Chute Weigh system is ideally suited for conversion of a manual or hydraulic livestock squeeze chute (cattle crush) into a working livestock scale. Simple and easy to install, with a large weight capacity and weatherproof construction, the chute weigh can be installed within minutes. 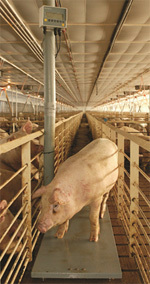 The Alley Weigh fits easily into alleyways and incorporates a non-slip surface ideal for weighing livestock, while its low profile makes it easy to weigh feed carts and bulk containers. Specially designed to work efficiently on uneven floors, the Alley Weigh uses the patented Weigh Bar system to ensure accurate weighing at all times.